I would like to tell that I am a singing girl))) My love is a song and I do my best to sing this song in the best way)It is an interesting question) My work is my hobby) Yes,I work in my leisure time and I really enjoy it a lot. The dog just licks unexpectedly his owner's hand, chafes with his shaggy muzzle, that the poor human could know that his friend will never leave him in need. This lady is a plain dealer! She is strong outside, but delicate inside. Very kind and pleasant in socializing. If you like order and cleanness, we will match easily)I can say that I smile in every situation. There are two lonely girls in my family: my lovely daughter Natasha and me. 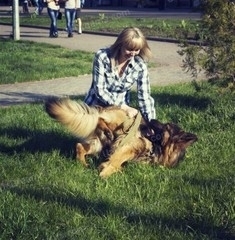 The only man in our girlish crew is our dog Limon) Natasha is a young independent lady, and I am a proud mother!) She likes to embroider and to make origami, so being in her company is never boring! Though we have nobody to support us, we are very close-knitted and vigorous. I'm an idealist, and I try to succeed in everything, but the most important for me is to become the best woman for my lovely man! The one, whom I will make a cup of coffee in the morning and give a tender kiss, wishing him a good night. will you make me a company here? Love is life! The life, you're living for another person, for your second half, and setting a high value on every minute near him. So I want to breathe with full lungs and feel the real life on a full scale! I wish my days to become brighter and filled with romance and adventures. I'm an idealist, and I try to succeed in everything, but the most important for me is to become the best woman for my lovely man! So I want to breathe with full lungs and feel the real life on a full scale!